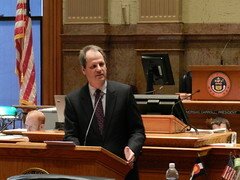 (Denver) – Senate Minority Leader Bill Cadman (R-Colorado Springs) issued the following statement today in response to the 10th Circuit Court of Appeals Ruling on a lawsuit challenging the constitutionality of the Colorado Taxpayer Bill of Rights. “Thanks to the ‘Taxpayer Bill of Rights,’ Colorado citizens are protected from the Taxaholics in Denver. Unfortunately, the Democrats believe taxation is their right and their duty; they are suing Colorado citizens so they can exercise this power. “I am extremely disappointed that the lawsuit instigated by Senator Andy Kerr (D-Lakewood) aimed at removing TABOR, will advance after Friday's ruling by the 10th U.S. Circuit Court of Appeals."